If you’re wondering what happened to the long-gestating plans to renovate Albany’s Sunrise Park, wonder no more. The city parks department hopes to call for bids on the project by the first week of February. The renovation has been planned since 2013 as part of Albany’s approach to using federal grant money to improve conditions for residents of low to moderate income. The city has budgeted $239,000 for the project during the current budget year. For a while the project was delayed when it was determined that the park includes “wetlands” deserving of protection under state and federal rules. 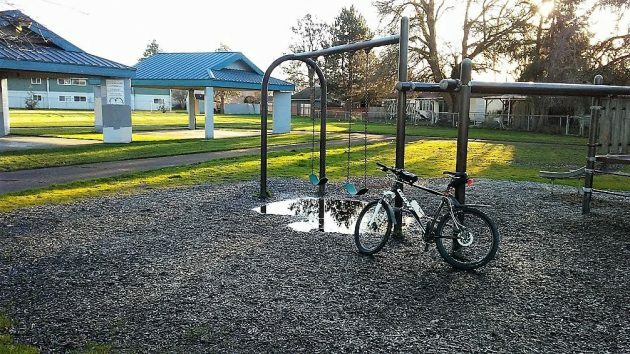 This forced the city to spend $38,000 in anti-poverty grant money to purchase credits in a Eugene wetlands “bank” to make up for the loss of wetlands in the park. When I visited the park on Jan. 6, there was a puddle under the swings in the playground. So yes, the playground does qualify as being wet after it has rained. 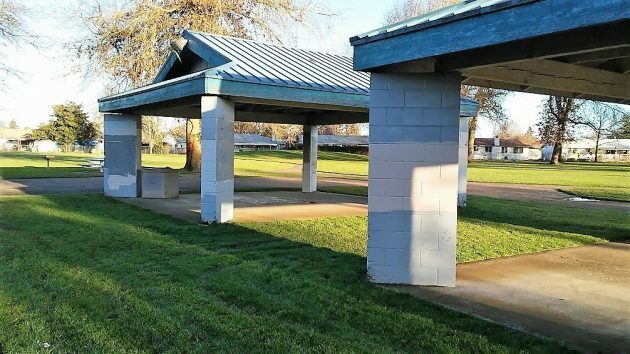 These shelters, where graffiti have been painted over, will be demolished as part of the Sunrise Park renovation.